Pedal powered rail vehicles date back to at least the 1850’s, when maintenance workers used hand-cars and ‘rail bikes’ to travel along the tracks. They were used to transport crew and materials for track inspection and repairs. Today, there are a variety of designs in use around the world: the ‘Draisine’ of Europe; ‘rail bikes’ with aluminum frames and rubber wheels; and modified road bikes with an outrigger wheel. Our custom built Rail Explorers are the latest development of this technology, and are the global leader in safety, design and ease of operation. All Rail Explorers can be coupled together so that larger groups can stay together and combine their leg power! 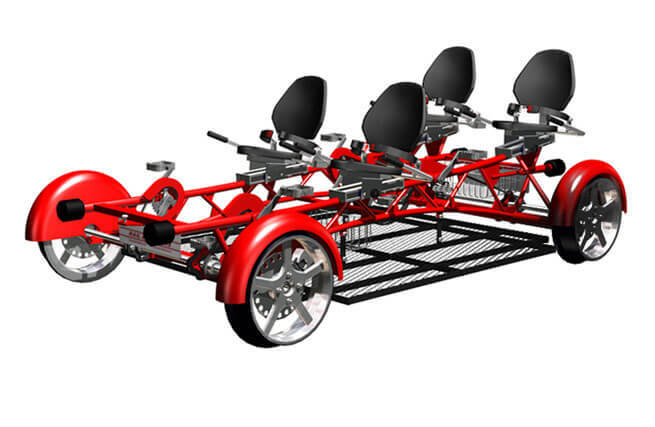 Eg: Couple together a Tandem and a Quad for a group of 6. 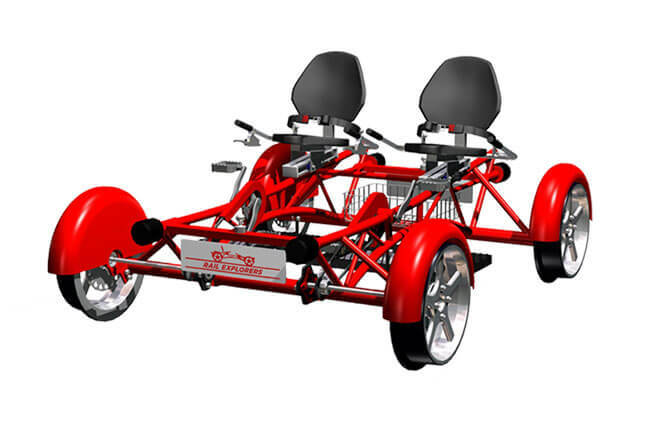 Or two Tandems if no Quads are available. The 'Cadillac' of our fleet is the 4 person Quad Explorer. 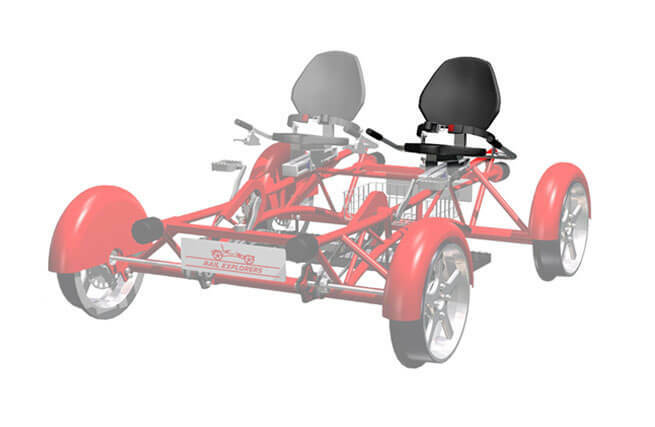 With 4 seats and 4 sets of pedals, this is ideal for families or groups of friends. At 10 feet long, and weighing in at over 750 lbs, when the quad gets going it doesn't want to stop. Not everyone has to pedal - in fact it is possible for 2 people to enjoy a ride on the Quad Explorer or for 2 to pedal and 2 others get a free ride! Looking for a romantic experience with your partner? Or an opportunity to create a lasting memory for two? The Tandem is for you. With 2 seats this is the 'coupe' of the fleet - the sports convertible built for two, with the top always down. At 6 feet long and weighing 350 pounds it is fast, slim and gobbles up the miles. Tandems can be linked together to accomodate additional riders. The single rider VIP seat is either up front in the first Tandem Explorer or in the last Tandem Explorer alongside one of our friendly tour guides. The VIP Seat is also ideal for odd numbered groups - if you have a group of five, one option is to book a Quad and a VIP Seat. To keep the group together the Quad will be placed directly behind the VIP Guide Tandem. *VIP Seats not available in all locations.